15:00-16:00 Keynote lecture: Raphaële Garrod (CRASSH and Newnham College, University of Cambridge), Natural History in Early Modern France: The Poetics of an Epistemic Genre? Last week, on 6 and 7 November, our research group co-organized with the IRH-UB the 6th edition of the Bucharest Colloquium in Early Modern Science. The event marked a good opportunity to bring to Bucharest scholars working on different aspects of the early modern experimentation. 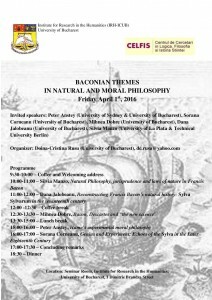 During these two days of intensive discussions about early modern natural philosophy, we explored several important themes, such as the role of illustrations in early modern scientific writings; the interaction between mathematics, experiments, and philosophical principles; the role of early modern women in the dissemination of the new science; various aspects of a number of important figures, such as Newton, Leibniz, Descartes, Maupertuis, Spinoza etc. Most of the participants in the Bucharest Colloquium in Early Modern Science were from other countries, as only 3 out of 16 speakers were affiliated to institutes in Romania. It is worth emphasizing the international aspect of the event, because one of the important outcomes was to strengthen some of the collaborations between the members of the Romanian team and our colleagues from other universities. During the past few days, we opened the way of future collaboration and the possibilities of building together research projects at European and international level. We can only hope that our future events organized in the research project “From Natural History to Science: the emergence of experimental philosophy” will build upon the success of the 6th edition of the Bucharest Colloquium in Early Modern Science. This is the fifth edition of the Bucharest Colloquium in Early Modern Science to be held at the University of Bucharest. Invited speakers: Daniel Garber (Princeton University), Paul Lodge (University of Oxford), Arianna Borrelli (Technical University, Berlin). 14:00-14:40 Norman Whitman (Rhodes College, Memphis) Finalism in Spinoza’s Physics? 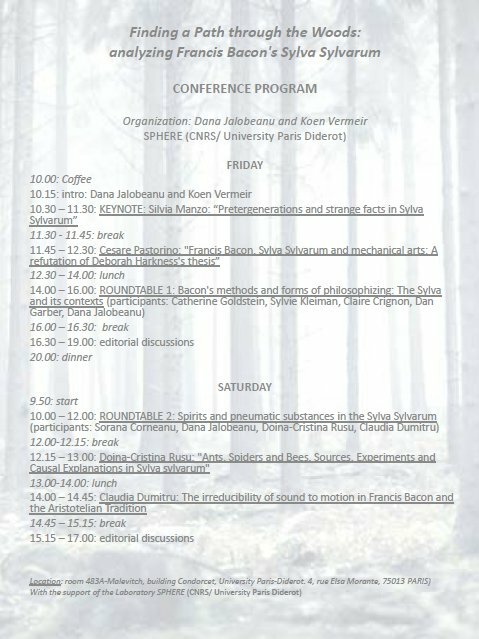 In December, some of our team members (Dana Jalobeanu, Oana Matei, Doina-Cristina Rusu and Claudia Dumitru) attended Finding a Path through the Woods, a two-day conference on Sylva Sylvarum in Paris, organized by Dana Jalobeanu and Koen Vermeir. The event was one in a series of seminars and workshops on Sylva that started in Princeton in 2012 and will be continued with a meeting in Berlin in March 2015. The most important result of this meeting was putting together a preliminary list of topics or problems that could form the core of a volume of scholarly articles on Sylva Sylvarum. The reading groups were particularly helpful in this respect. You can see most of the issues discussed by our team at the second reading group of the conference, on spirits and pneumatic substances in Sylva, in this post. We also had a chance to meet the French team translating Sylva Sylvarum (Claire Crignon, Sylvia Kleiman), who contributed to the first reading group. Doina-Cristina Rusu and Claudia Dumitru also presented papers at this conference. Doina talked about Francis Bacon’s use of sources, expanding on his famous metaphor about ants, spiders and bees. By analyzing some of the material in Sylva Sylvarum in relation with its sources (Giambattista della Porta and Hugh Platt), she tried to show that Bacon follows his own methodological injunctions and, far from simply lifting material from others, he reflects on it critically and transforms it. That would mean that the bee (who digests and renders useful the stuff it feeds on) is a symbol not only for philosophy, but also for natural history undertaken philosophically. Claudia talked about a specific set of experiments from Sylva Sylvarum – those dealing with sounds. She tried to show how one problem that was vital to the Aristotelian background theory, that of the irreducibility of sound to motion, shapes much of Bacon’s inquiry in Sylva and arguably puts him against the dominant trend in the later part of the seventeenth century. This week, some of the members of our team (Dana Jalobeanu, Oana Matei, Doina-Cristina Rusu and Claudia Dumitru) will give talks and participate in the reading groups at a conference on Sylva sylvarum organized in Paris (12-13.12.2014) by Dana Jalobeanu and Koen Vermeir. You can find the program and details about the location below. 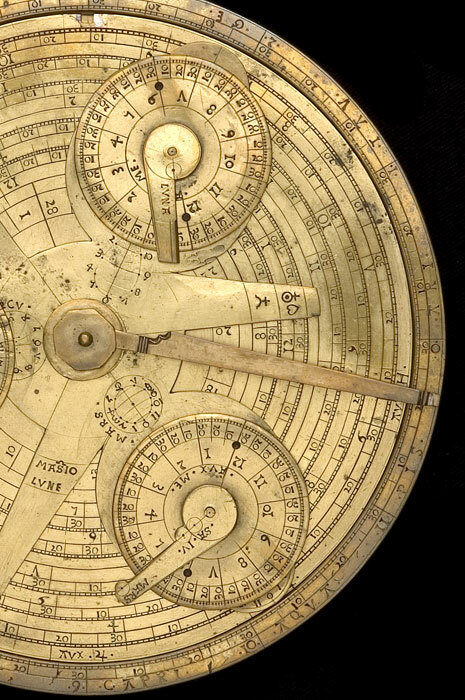 Our team – in collaboration with the New Europe College (via the ERC Starting Grant “Medicine of the Mind in Early Modern England”) – is organizing a workshop on the history and philosophy of early modern experimentation. 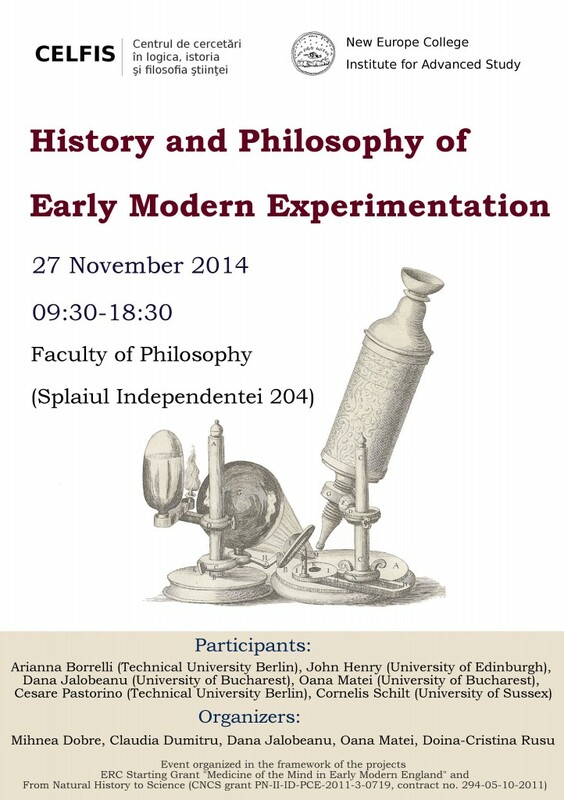 The workshop is to take place at the Faculty of Philosophy (Splaiul Independentei 204) on November 27 2014. The full programme is below. 12:00-13:00 John Henry (University of Edinburgh) – The Only Game in Town? Why Did Early Modern Reformers of Natural Philosophy Turn Almost Exclusively to the Occult to Replace Scholasticism? 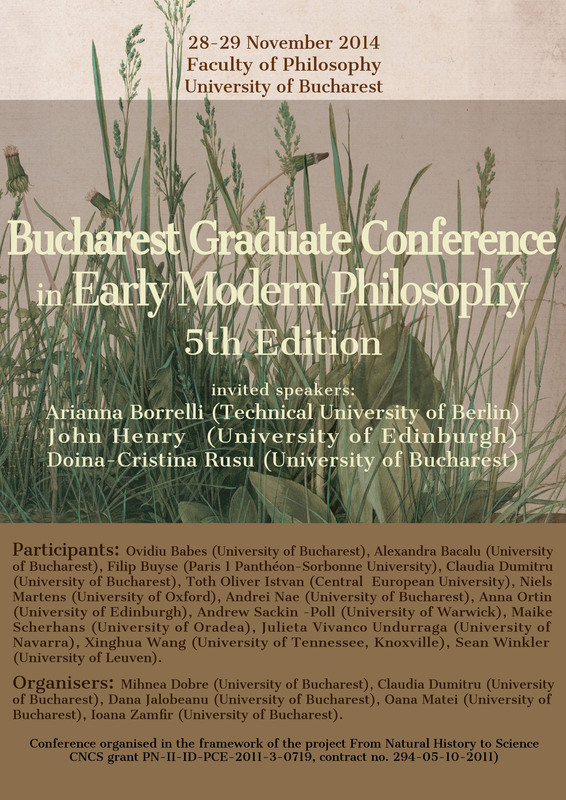 Here is the programme for this year’s edition of the Bucharest Graduate Conference in Early Modern Philosophy, to be held at the Faculty of Philosophy (Splaiul Independentei 204 – see on a map) on 28-29 November 2014. 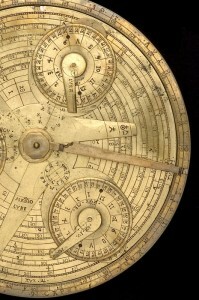 9.30-10.30: Invited talk: John Henry (University of Edinburgh) – The Newtonian Moment: How Action at a Distance Became Part of Mainstream Physics (Uniquely) throughout the Long Eighteenth Century. 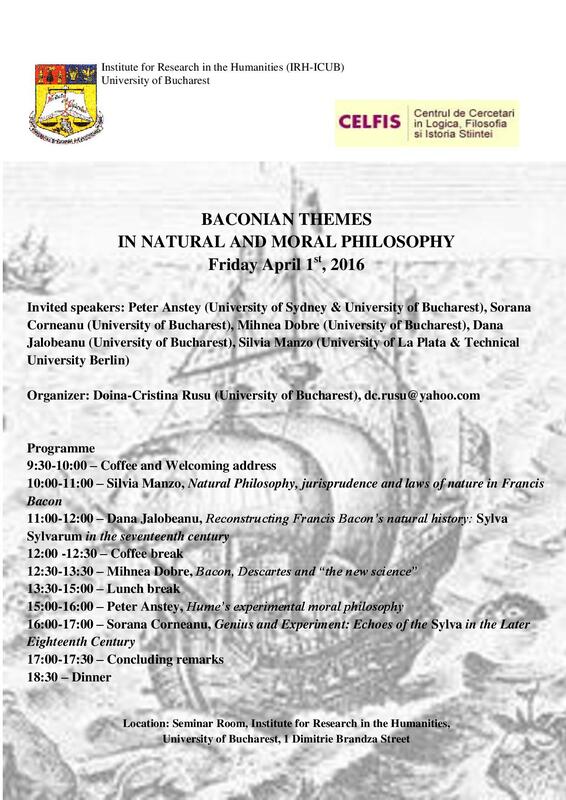 16:50-17.50: Invited talk: Doina-Cristina Rusu (University of Bucharest) – Forms and Laws of Nature in Francis Bacon’s Natural Philosophy. Some notes on the reading group Naturalism: Cardano, Telesio, and Bacon (Bucharest-Princeton Seminar in Early Modern Philosophy, Bran 8-13 July 2014). Proponents: Daniel Garber, Mihnea Dobre, Doina-Cristina Rusu. The reading group examined some of the views of Girolamo Cardano, Bernardino Telesio, and Francis Bacon. We selected passages from Cardano’s De subtilitate (book II), Telesio’s On the nature of things (chaps. 8-16), and Bacon’s Sylva (experiments 30-32, 800-830) and the Novum Organum II. From the point of view of our research project, From Natural History to Science: the emergence of experimental philosophy, this was very important as it put in comparison Bacon’s views with some of his sources. We were especially interested in exploring the views of the three philosophers with respect to spirits, qualities, principles, and elements. We discussed the relation between heat, fire, and motion. Further, we compared the nature of air and the notion of “perception” in the three philosophers, asking how this would entail more experimental possibilities. Our discussion was framed by the cosmological views of Cardano and Telesio. In Cardano, we were interested in his tripartite division of the elements (earth, air, and water) and what would be the status of fire (seen as a quality) in this new cosmological image. Cardano’s investigation of fire and his attempt to provide new experimental techniques for studying it allowed us to raise one of the main questions of the Bucharest-Princeton Seminar; namely, what “naturalization” means? 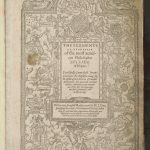 Is this a worthy concept to describe the various attempts of early modern philosophers to pursue a more systematic empirical investigation of nature? With Telesio we turned to explore the nature of air as the intermediate medium between the sky and the earth. We addressed the problem of how heat and cold act in the world and cause all the phenomena, and we opened the question of subtlety in experimental context. This question was further addressed in the case of the passages selected from Francis Bacon. His use of the weather-glass for exploring the effects of air and heat was discussed in the selected passages. The issue of measurement and how to perform accurate observations with the instruments was singled out in our discussion.